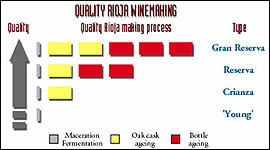 Reserva Wines must be developed for a minimum of 3 years in oak and minimum of two years in the bottle. Gran Reserva Made only in the finest Vintages. At least 5 years in the cellar - at least two years in oak and three year in the bottle. A wine cellar that only produces Rioja wines of quality. At present, El Coto de Rioja is reckoned to be one of the leading 'bodegas' in Spain, and their wines are exported throughout the world. El Coto is located in Oyon (Alava), with a total area of 110.000 sq.m, more than 50.000 of which are occupied by buildings. Stainless Steel Tanks up to 450.000 Ltr. Approximately 15 million bottles of oak aged red wines rest silently in the El Coto cellars. The vineyards are located in Cenicero (Rioja Alta), close to the Najerilla river (a tributary to the Ebro river), facing Northwest and with a, predominantly, ferric-clayey soil. The rest of the grapes come from selected winegrowers in Rioja Alavesa. 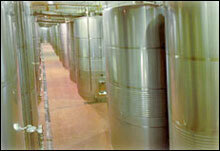 All the grapes are fermented in temperature controlled stainless steel tanks. El Coto is currently using some 23 millions kg of grapes per annum. El Coto facilities are equipped with an automatic temperature and humidity control, which guarantees the right conditions for the bBottle and oak ageing periods. Oak ageing facilities count for 70.000 oak barrels (Bordeaux type: 225 litres capacity), 90% of them being of American origin, the remaining 10% being French. The average time of utilisation of the oak barrels at El Coto de Rioja is 4,9 years from their elaboration date. These oak barrels are kept in perfect shape, as they are washed and manipulated automatically. The barriques don't ever touch the ground. El Coto has preserved the same architectonic style for all the buildings at the premises, with the goal of making El Coto de Rioja, not only a winery, but also a harmonious complex, ready to welcome the increasing number of visitors every year. El Coto de Rioja started as the personal project of a small number of people whose prestige in Rioja was already then widely reckoned. Nowadays, nearly all of them still work here and control the 'bodega', but new people have also been joining in so that the bodega's continuity and development is guaranteed. El Coto de Rioja vinified its first grapes in 1970, and this vintage was released in 1975. In July 1997 Barón de Ley became the first public winery group in Rioja to come up in the Spanish stock exchange as part of the Barón de Ley group. El Coto history has been and still is one of continuous improvement and development, and aiming at this, all the resources generated by their activity have been automatically reinvested. This is a basic line in El Coto policy as a 'bodega' that is all the time seeking to improve its wines and its activities. We are delighted to inform you that El Coto wines Museum Crianza 2001 and Museum Real Reserva 2001, have been rewarded with a Silver medal by the Concours Mondiale de Bruxelles (www.concoursmondial.be) . These awards underline the excellence of the 2001 vintage, severely marked by a frost in late May that reduced dramatically El Coto's yields but also provided them with a tremendous ripening and concentration. More medals were received at International London Wine Trade Fair. Recently Museum Real Reserva 2001 won a Gold Medal in Ireland. We stock Museum Real Reserve 2001 - a Great Vintage!